Owls are all over Folksy this week, so I thought I'd share one of my favourites with you. This mobile is stuffed with lavender to aid sleep, this would be the perfect gift for a new baby! This one has a lovely pink and cream polka dot tummy and matching button eyes! Hangs from a satin ribbon. Moon measures 18cm in diameter. 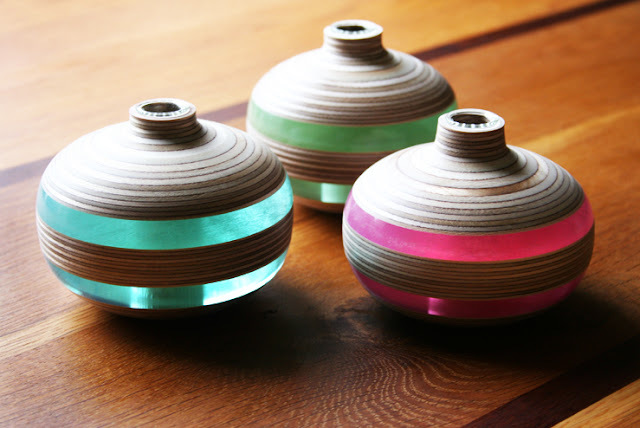 A fun kinetic piece from Rachael Sudlow! Like waving grasses, long strips of sterling silver are locked into place on a length of sterling silver chain. Hammered to a bright shine, they curve and move freely. 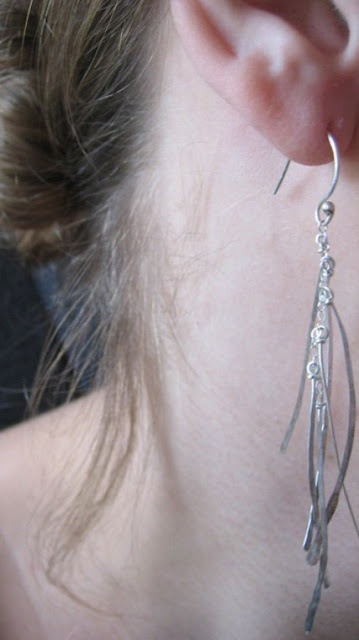 Hung from a sterling silver earwire. They measure a little over 3" long (8.5cm). Packaged in a little gift box, perfect for giving. A handmade frame and panelled backboard made from reclaimed wood, whitewashed, and then over-printed with distressed image and typography. 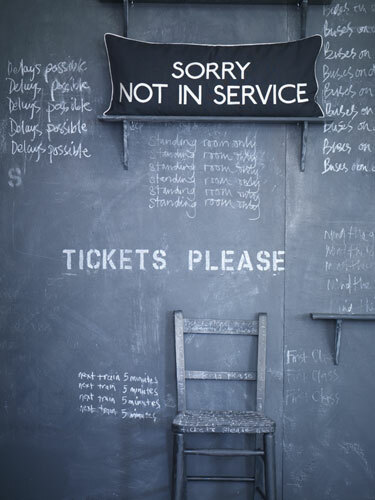 The frame and panelled backboard are handmade using reclaimed antique Victorian roof timbers. Defects are purposefully retained in the timber to add to the charm and character of the piece. 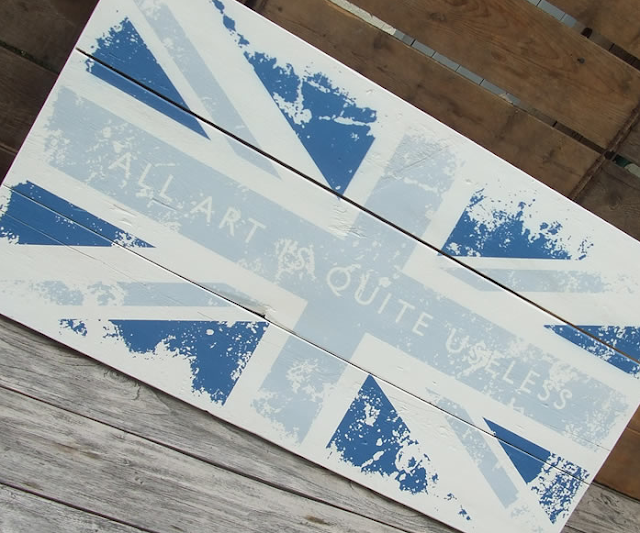 These can include knot holes, nail holes, warps and water marks, so each artwork is totally unique. Chic must have cushion, über-cool and inspired by vintage bus destination blinds. Embroidered font in cream on beautiful quality linen/cotton, contrast piping in cream gives this cushion wonderful vintage styling. Fastened with two mother of pearl buttons on reverse. A fantastic product that has been displayed absolutely beautifully with photography by Emma Lee and styling by Twig Hutchinson. These mini notebooks have been created using traditional bookbinding methods. The spine on each book has been left exposed (it's such a shame to hide this particularly attractive feature!) Rather than using traditional linen tape, Kate has used vintage bias binding and coloured button cottons. The book covers were originally shoe leather samples and are secured with a Dorset button and plaited threads. Measurements: height 6.5cm, width 6.5 cm and depth 2 cm. Each book contains 10 signatures, or 50 folios (folded pages), of assorted recycled papers. Beautiful! 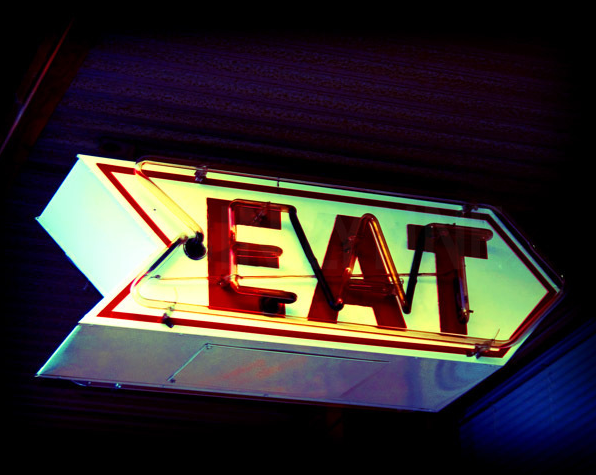 An 8x10" matte-finish fine art print of "Eat" by Robin Lynne. Eat. That's all. Taken just before sunset in Decatur, AL in front of the City Cafe, on the corner of Moulton & 1st. Slightly retro, very colorful and the perfect piece to add that vintage feel to your kitchen or dining room – or any room! Professionally printed on Kodak Professional Portra Endura Paper. 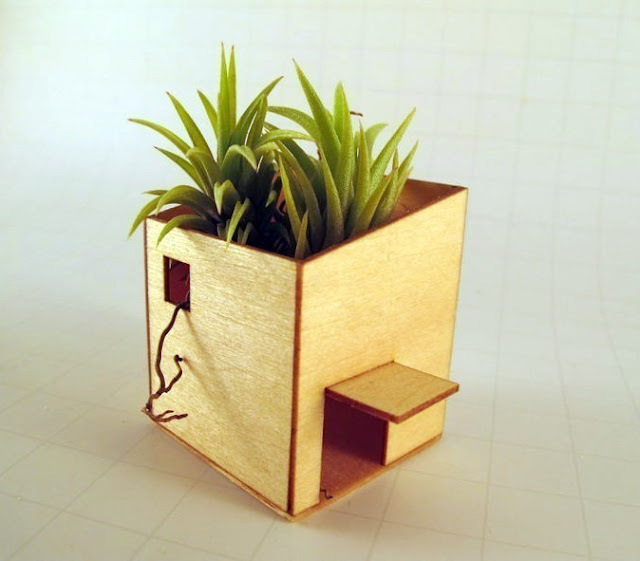 Handcrafted wooden house with air plant. Doorways and windows allow roots to peek out. Sealed with an eco-friendly product so you can give your new air plant a little mist here and there without damaging its home. Approx 1.25" cubed includes 1-2 air plants and care instructions. 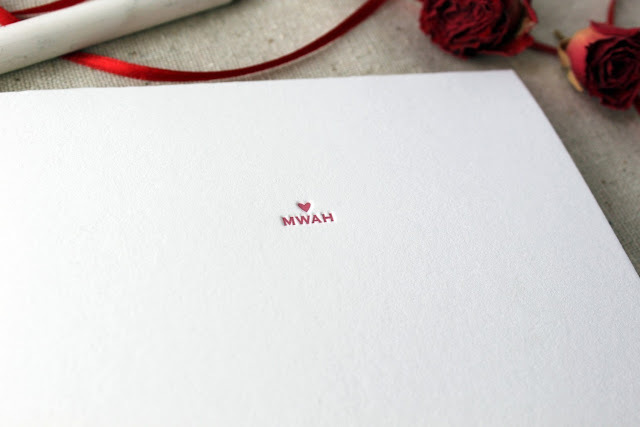 Designed and printed with love by Paper Lovely. Hand printed on a Golding Pearl #3 letterpress. 5 folded note cards + 5 envelopes, packaged inside a clear cello sleeve wrapped in satin ribbon. 3 1/2" x 4 7/8". Simply 'mwah' dahling! 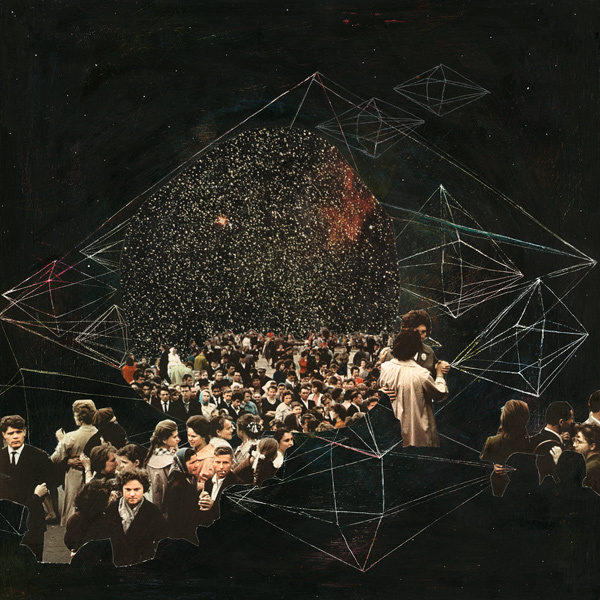 Digital archival print of an original mixed media collage by Brandi Strickland. Each limited edition print is signed, titled, numbered and dated by the artist. Printed on Hahnemuhle German Etching Paper with an Epson printer using archival pigment inks. 7×7" print on 8.5×11" sheet. Limited edition of 50. Very ingenious knitted brooch, made from multi-coloured fimo with a metal brooch pin to the reverse. It goes with any colour and would be a great addition to a lovely winter coat. Approx 5cm x 5cm. 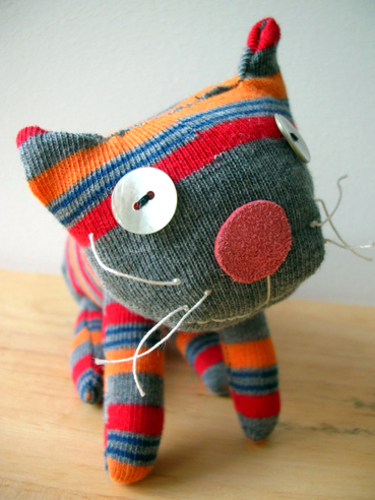 Cool cotton striped sock kitty, with mother pearl eyes and pink leather nose. 22 cm x 9 cm. Soft and playful, and comes with a beautiful floral paper box. Ideal for a gift! Beautiful and unusual. Handbuilt, fired to cone 6. The goblets hold 12 ounces. Microwave and dishwasher safe. 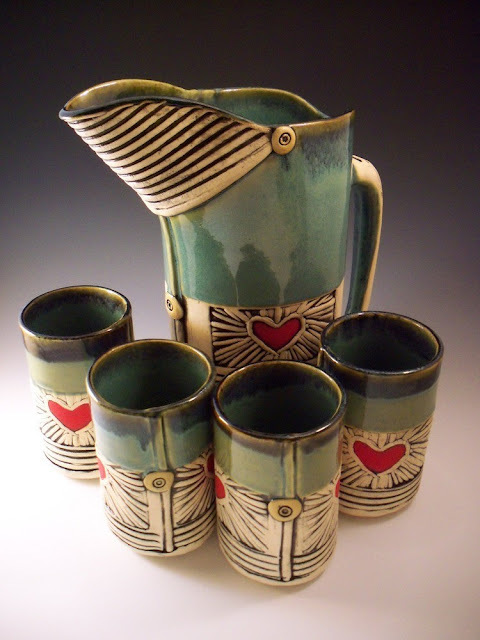 Yellow buttons, green glaze, red hearts. Oh, say what you really feel?! He's a potty mouth and doesn't care. This bear doesn't hold back. Point him in the direction of the source of your annoyance and let him do the talking. He can't pay the swear jar BECAUSE HE'S A BEAR!! 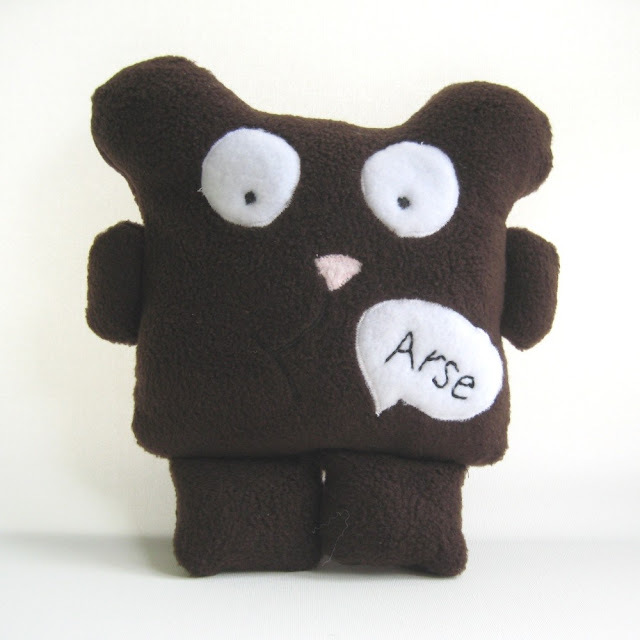 Swear Bear is made from soft fleece fabric and his face and features are machine appliquéd. Swear Bear is 9" tall (23cm) from ear to toe and 9" across (23cm). I caught these on the Etsy email today, and they made me smile so much, I had to feature them! Every crimefighter needs a good pair of shoes. With these super wings, your little hero can leap through the air and save the day in their own super adventure! 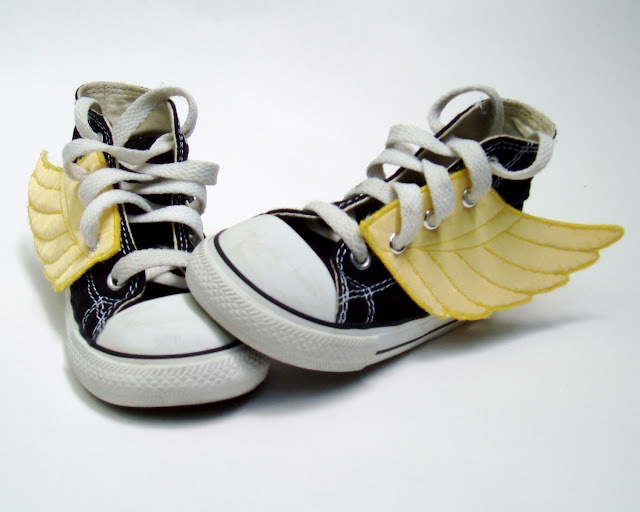 These lace on wings will fit any child's shoe, and even up to the smaller adult shoes. Simply attach them using the shoe's laces. Smallfly also do custom orders for bigger feet too! Now is the time to get your hands on one of these beauties, before all the beneficial insects retire for the winter. This insect habitat is ideal for hanging in a sheltered garden, on a house wall or in an orchard. It will provide much needed shelter for insects such as Mason Bees or Leafcutter Bees, which are non aggressive and excellent for pollinating in the garden, helping to increase fruit yields. The durable roof and solid timber construction also give excellent insulation for over wintering Ladybirds and Lacewings. Site using the supplied hanger in a sheltered spot, preferably to catch the morning sun, and to keep the rain from flooding the bees bedrooms. 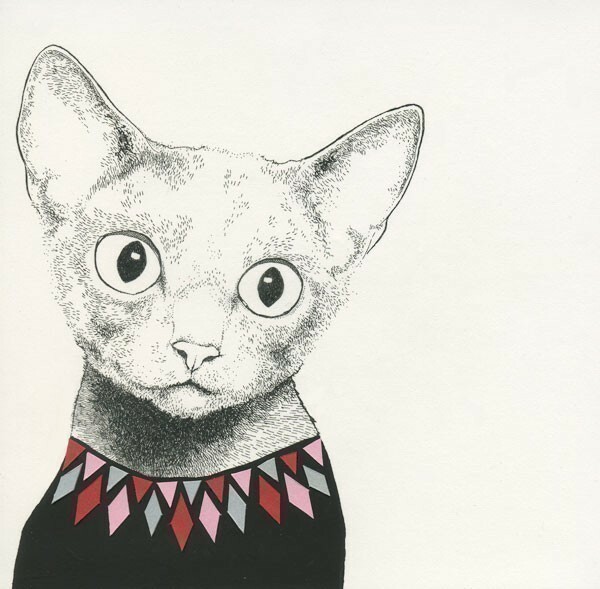 Cute as a button – these lovely notecards are printed and embellished with a mix of white buttons. 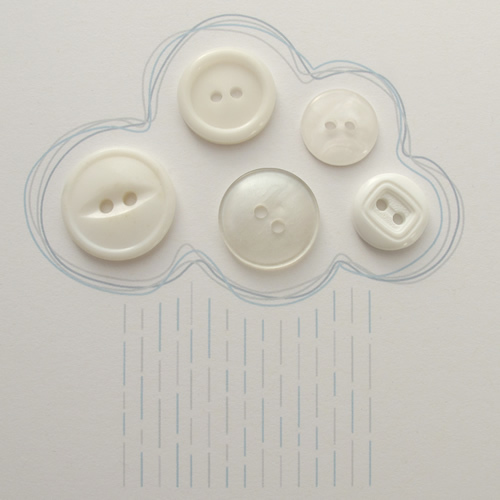 A rain cloud is printed in the centre of each card decorated with 5 white buttons. Each card is blank on the inside so you can add your own message. Cards measure 12cm x 12cm and are made from 100% recycled card stock and are matched with envelopes which are also made from 100% recycled brown craft paper. Packaged in a biodegradable corn starch bag – this is a very eco friendly product. Nice one Evie – now we just need to convince all those other card makers that still use nasty plastic! The latest from wallet makers randL Wealth Management Systems in collaboration with talented artist/printers from Slow Loris. Slim, lightweight notebook cover made from fade resistant marine canvas. Beautiful colours and simple, yet clever construction. 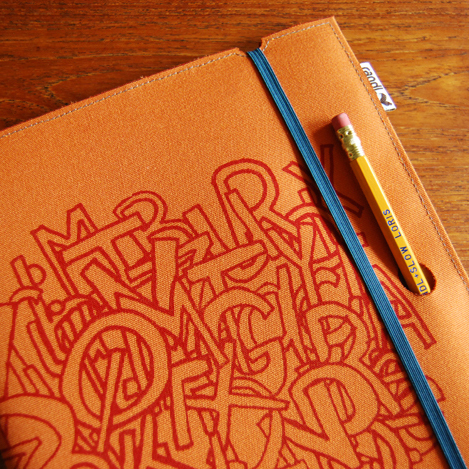 Features: pen/pencil slot, elastic band closure, Extra Large Moleskine Cahier notebook and pencil. Dimensions: 7.75” X 10.5". Wow! Polished FSC graded Birch plywood with 10mm bands of translucent pink acrylic. Approximately 100mm wide by 76mm tall these smaller versions of the oval 3 design have a small test tube fitted into the top so they can carry a single stem flower. This is a print taken from a set of two ink, watercolour and paper collage artworks. Measures approx. 5" x 5” with an added white border for framing. Printed on an archival, heavyweight fine art paper. This makes for a very beautiful print that shows every detail of the original artwork. Signed and dated by the artist. Funky and Unique! 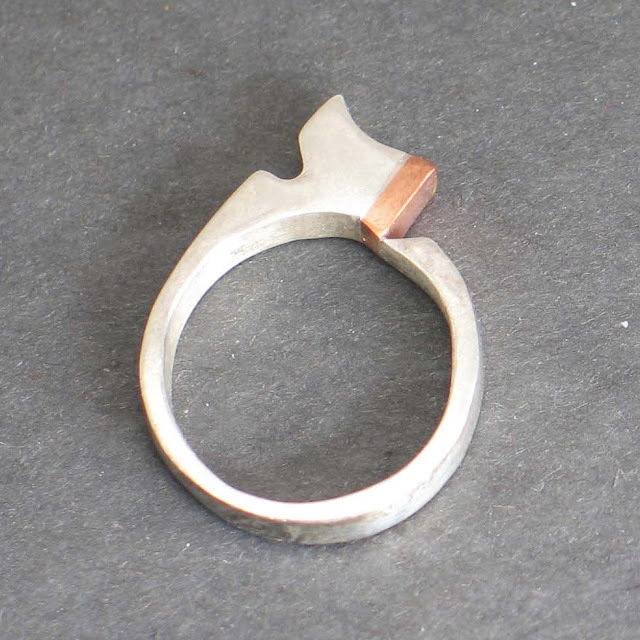 Cast sterling ring with copper sheet. One of a kind. All wax work, casting, soldering, sanding and polishing done by hand. This is a size 6 ring. 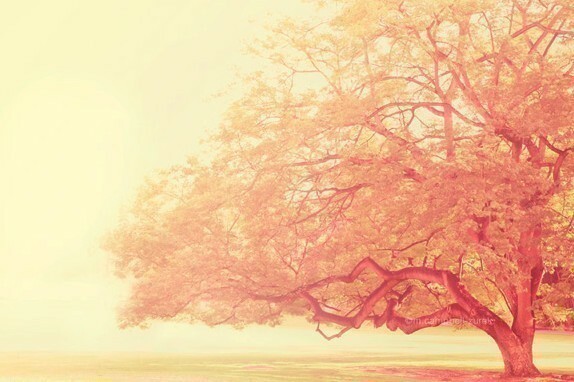 This fantastic photograph of a Los Angeles tree is dreamy and ethereal. An 8" x 12" original fine art print with a lustre finish. Superb. Wonderful, naturally rounded black beach rock, drilled to house a gray pearl. It hangs from an 18 inch black rubber cord with sterling silver clasp. An unusual and casual statement necklace! 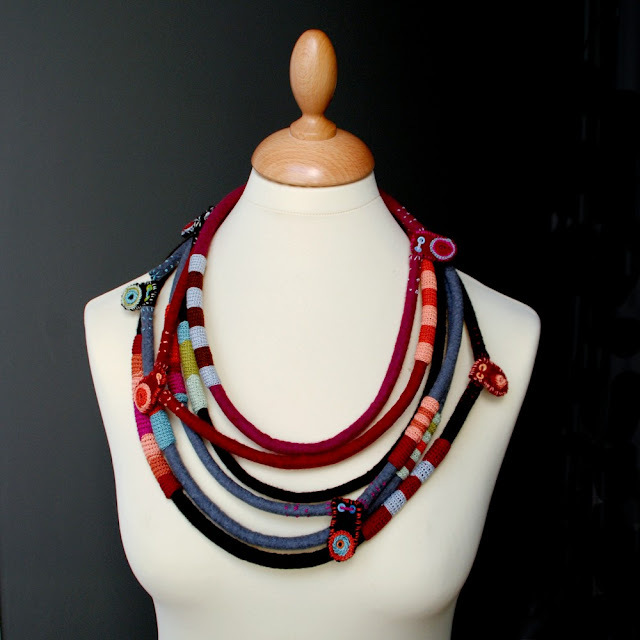 This beautiful and unusual long textile necklace is from kjoo. Made from pure merino wool felt, cotton thread and a vintage button! There's loads of subtle colours in this graphical/tribal masterpiece! Fantastic! This design has ancient origins: the little drawing of a Duiker (that is in repeat) is taken from a 2000-year-old cave drawing in the Cedarberg, just a few hours north of Cape Town. 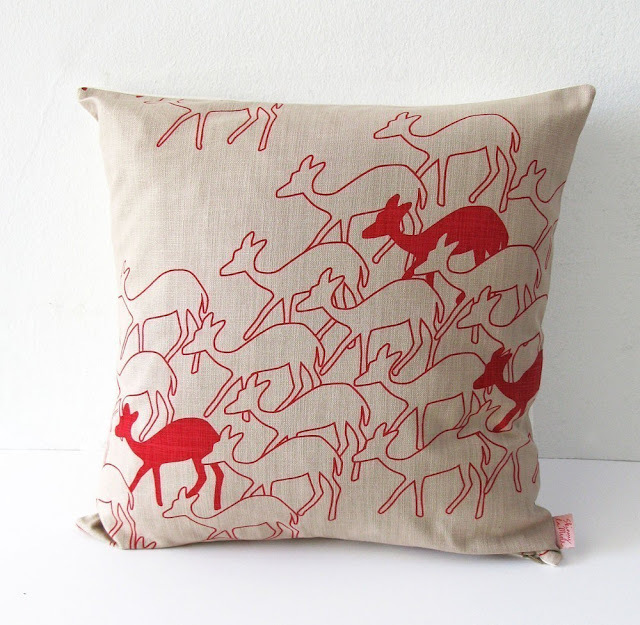 The Duikers design is screenprinted with waterbased ink onto 100% cotton with a linen-look slubby texture, and overdyed in a natural tone. It's backed in natural toned cotton/linen and closes with a zip at the base. 18" x 18". 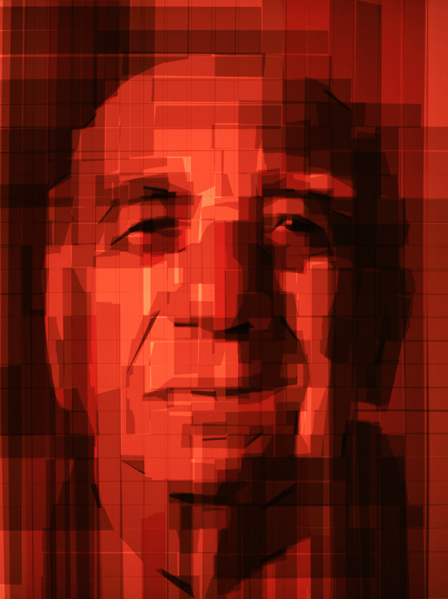 Gregorij, from the Portraits in Red series, 2010. Created using packing tape on backlit 36"x48" acrylic panel. Absolutely fantastic work from the very talented Mark Khaisman – I cannot believe that this has just been created from pieces of packing tape. Super soft and lightweight organic cotton unisex size tee. 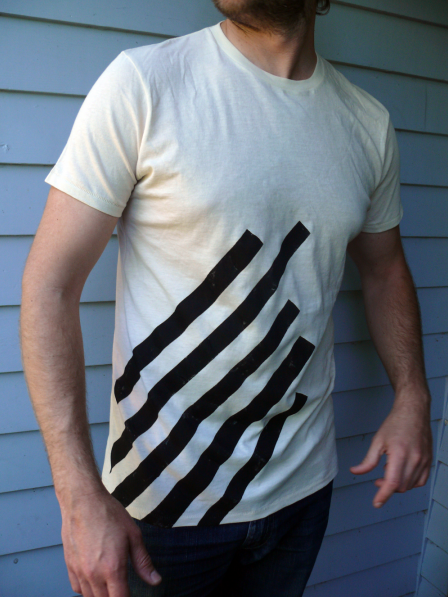 Hand painted on a creamy white with a black striped pattern. Non toxic water based inks were used and heat set to prevent against fading. Available in unisex sizes: XS, S, M, L, XL. Made to order. Each shirt has been hand painted and will represent the design slightly differently. Each is unique. Beautiful felt brooch, individually designed and hand crafted, measuring 8cm in diameter. Made from several pieces of co-ordinating felt. Hand embroidered with silk cotton using a freeform technique; a button completes the design! A silver bar brooch is attached to the reverse to enable you to pin it to a jacket, bag, hat, etc. Earthy earrings with texture of the desert floor, created by roll-printing the skeleton of a leaf. 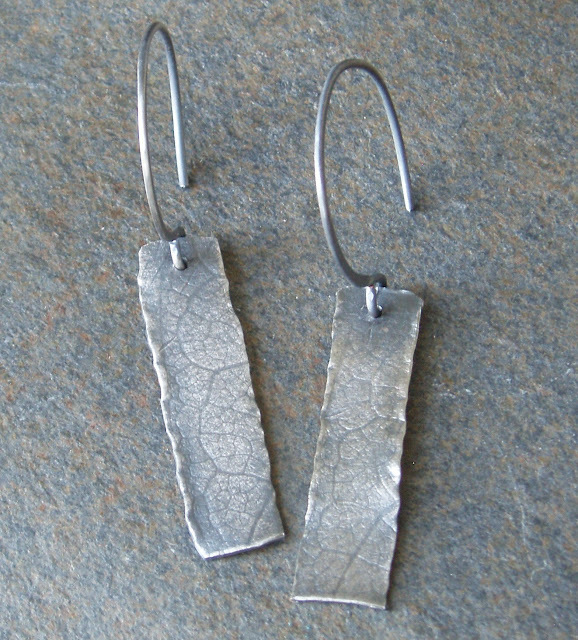 These earrings have a hammered edge for visual interest and handmade earwires. They measure .25" x 1.875" Total length. Due to the unique process used to create these earrings each pair may vary. 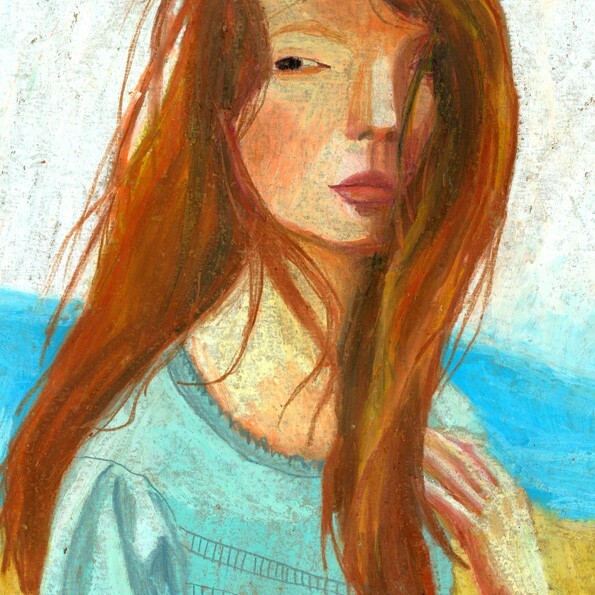 "Breeze" – a beautiful original artwork, created with pastels on brown paper. 8 x 11 inches. 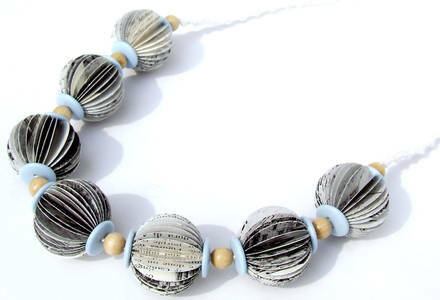 Necklace made using pages from a book on Canaletto with wooden beads and pale (Canaletto) blue buttons strung on a hand made macramé cord with button and loop closure. Light spray varnish gives some protection. Each bead measures 3cm approx diameter. Total length end to end is 53cm.